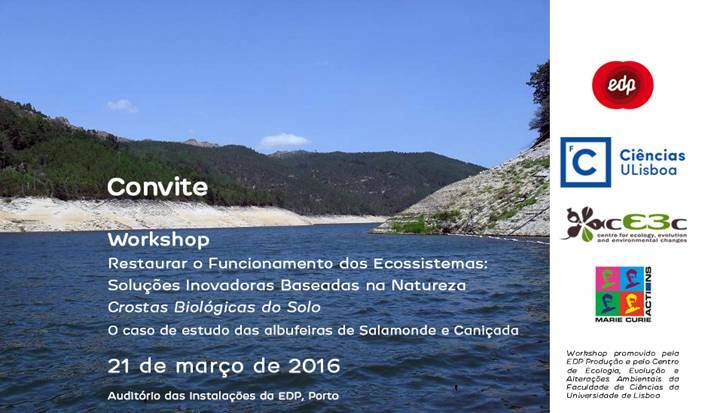 The first meeting for the onset of a Portuguese Network for Ecological Restoration will be organized at FCUL, March 21 2019. Its open for everyone, after registration. Cristina Branquinho won the 2018 Science Prize of UL/CGD, celebrating the researcher scientific achievements and to support the publication in high quality international journals. February 2019. Cristina Branquinho was chosen to be part of the Portuguese researcher’s group honoured by Ciência Viva in 2019. Facing climate change ant protecting the montado using plant functional traits to make these areas less vunerable to desertification. One of the biggest newspapers in Portugal published NitroPortugal's work and showed the importance of learning about nitrogen issues to protect our planet. An animation was produced within NitroPortugal, to raise awareness on the nitrogen problem and propose solutions for a sustainable environment. The video is available in Portuguese and English. Cristina Branquinho will host the session and moderate the discussion that will follow the biological invasions talks. Filipe Bernardo, PhD student (3CBIO/eChanges & IERS) Helena Serrano & Sofia Augusto presented an oral communication. eChanges participates in the public consultation on the national program for adaptation to Cliamate Change, giving a scientific insight to the program, helping making it better for everyone. Paula Matos, won the 2018 edition of SPECO Ecology PhD award. Titled "Development of ecological indicators of climate change based on lichen functional diversity". 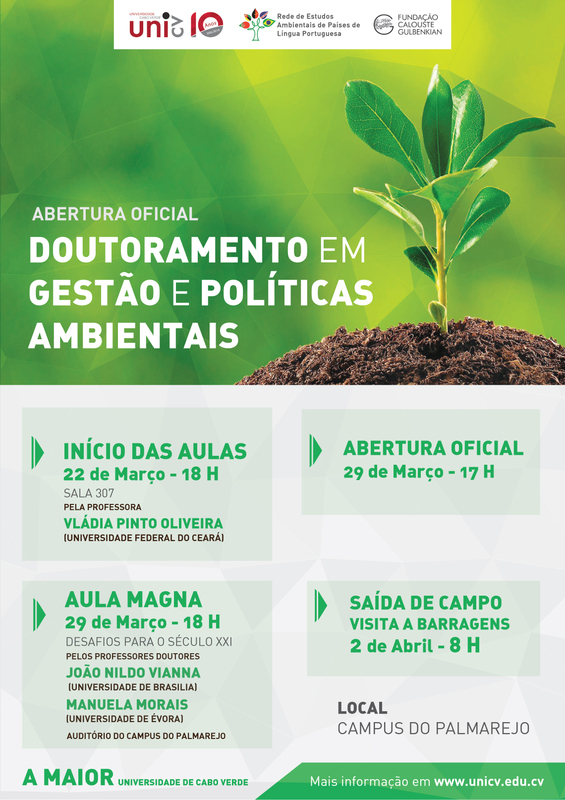 Phd on Biology and Ecology of Global Changes in Lisboa and Aveiro Universities. For the past 20 years SECIL and FCUL have been working togheter to learn about the complexities and opportunities of manage biodiversity and overcoming restoration challenges. All of the work is now compiled in a book. 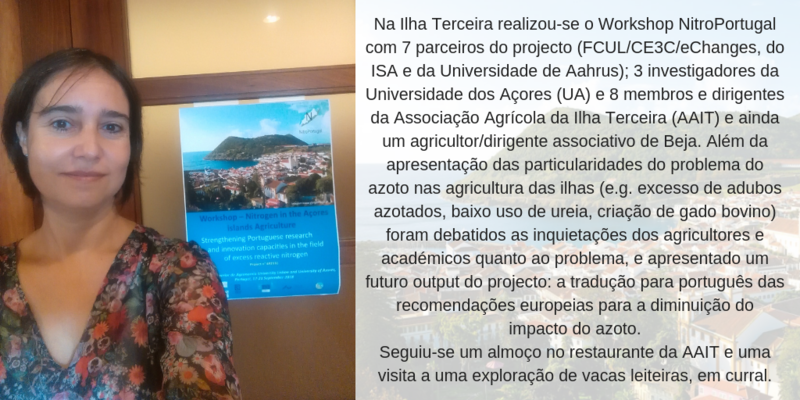 Strengthening Portuguese research and innovation capacities in the field of excess reactive nitrogen eChanges at the NitroPortugal Workshop – Nitrogen in the Açores Islands Agriculture. The impact of natural and anthropogenic pollution on ecosystems & human health: Which indicators should we use? Investigators Cristina Branquinho, Paula Matos & Pedro Pinho at the NitroPortugal Workshop. The cE3c PhD Merit Award of 2018 was delivered to Alice Nunes during- Frontiers in E3. Members of echanges participate in this annual event, where cE3c researchers gather together to present and discuss their latest projects, scientific results and outreach initiatives, and explore novel ideas. The impact of nitrogen pollution on ecosystems Invited as an expert in Multi-country workshop on Monitoring air pollution impacts on Mediterranean ecosystems Roland Bobbink gave an interview to cE3c, here. Researchers on air pollution in Mediterranean ecosystems, together to coordinate expertise and identify current impacts and future challenges. Alexandra Oliveira and Paula Matos have been taking measures of lichens in the Atlantic coast. Sara Lobo-Dias has been sampling in coastal sand dunes. Alice Nunes and Melanie Köbel have sampled functional diversity of Mediterranean woodlands in our research station at Herdade da Ribeira Abaixo. We have been using spring for doing field work for project and PhDs. 1st Workshop in Human Biomonitoring in Portugal Helena Serrano presents a poster titled "HBM? yes! but where to start? Optimizing biomonitoring by pinpointing areas of high exposure risk"
Cristina Branquinho(co-organizer) and Alice Nunes at the conference on "Enhancing Biodiversity and Ecosystems Services in Quarries - Challenges, Strategies and Practice"
4th session of "Portugal Biodiverso - Is the Quercus suber montado good for the country? Cristina Branquinho, representing SPECO, posed a very interesting question to Filipe Duarte Santos about the future of the montado system in Portugal. Strenghtening Portuguese research and innovation capacities in the field of excesso reactive nitrogen - Multi country workshop. Cristina Branquinho interviewed as a specialist in a report about the drought situation in Portugal. 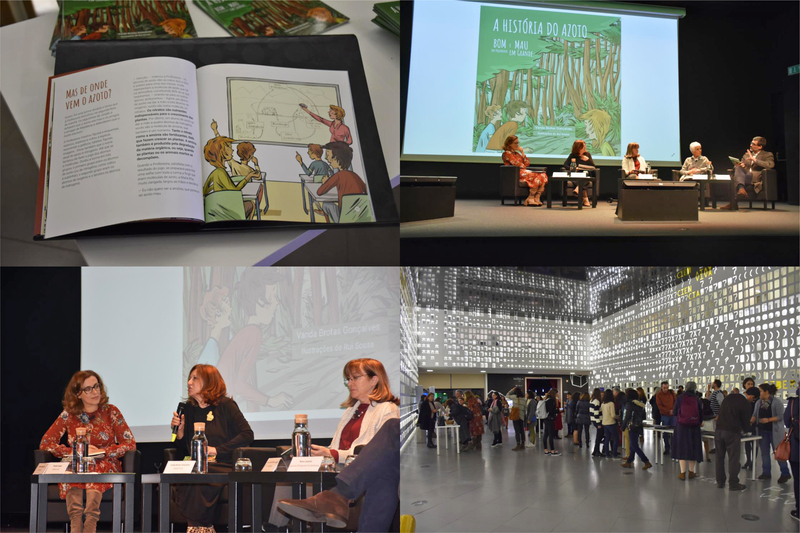 Cristina Branquinho participating in the Roundtable "Ecosystem Services in River Basins"
Alice Nunes, Paula Matos and Pedro Pinho were interviewed for their recently received awards. Alice Nunes & Helena Serrano won the 2nd and 4th prize in a competition organized by SPECO, for the best PhD in 2016-2017. Congratulations! Cristina Branquinho presents "Etical reasons for the preservation of biodiversity"
"Nitrogen is like ’The Godfather’ of pollution: you see the results but you don’t see the Godfather"
"Plant functional response to desertification and land degradation – contribution to restoration strategies"
Alice Nunes at "Sociedade Civil"
Paula Matos "Development of ecological indicators of climate change based on lichen functional diversity"
"Quest for ores: our natural resources"
Noite Europeia dos Investigadores "Biodiversidade pela sua saúde e bem-estar"
AdaptForChange 2nd workshop "Ecosystem services in semiarid transboundary basins"